You are here: Home / Gold / What are your Gold Investment options in India? What are your Gold Investment options in India? With Gold considered a must investment among Indians, how can one invest in gold and what Gold investment options in India does one have to ensure safe and returns oriented gold investments? We shall see here. Traditionally it is somehow imbibed in our psyche as Indians that no matter what you invest in, as long as you do not have Gold with you, you haven’t done well. This is even true in case of a lot of NRIs. 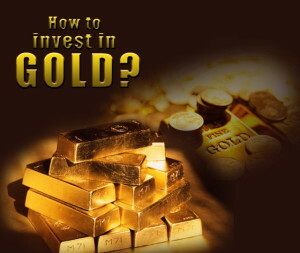 However, investing in Gold is not easy and comes with a lot of concerns, primarily the safety of physical gold and other issues like purity, the loss of gold on account of making jewellery, the wealth tax or other taxation concerns and of course, in the present scenario the volatility of gold price. In spite of all the concerns, we can’t resist the lure of yellow metal. So how do you go about it and what Gold Investment options you have? Gold is always said to be inflation proof, as any inflation will also mean that the price of Gold will also rise. In India, we have mainly 4 options of investing in Gold in India. And they are explained below. However it must be noted that most financial planners recommend only 5% of your entire investment portfolio to have Gold investment, but then as they say “to each, his own”. The obvious and common way of investing in Gold in India, but also unsafe and not so tax friendly as it attracts wealth tax. The other concern with physical gold is that you may be tempted to invest in jewellery and that in turn defeats its whole purpose. Firstly jewellery will attract making charges that will add to the cost and has no added value to it. Secondly, jewellery will often have sentiment attached to it and will never be sold and even if sold, will be the last option and it defeats the whole point of investment. Also don’t even consider those gold savings/investment schemes by jewelers, here’s why. Also if you were to take gold bars from banks, banks will charge a premium on it and won’t buy it back. Even if bought from a jeweller, make sure that it is pure and has hallmark and keep the bills handy. Any physical gold will still need safe storage and banks lockers will be an added cost. Relatively newer to the Indian markets, E-Gold is better Gold Investment option than physical gold as it does not have the risks of physically storing gold. Also, it won’t involve any administrative costs associated with gold mutual funds and ETFs. However, E-Gold will need a separate demat and gold trading account, so those not too savvy with the concept of demat and trading and even for those who already have a demat account; they will still need a separate one for this. Also from tax point of view, e-Gold is treated as physical gold. Also Read: Which are the best Gold Savings Scheme in India? Advantage of E-Gold is that it has more price transparency and the units in E-Gold can be redeemed as physical gold when needed. Also there are no recurring expenses like those in other methods like ETFs or gold mutual funds. So if you can understand the relatively newer concept of it and can manage the separate demat and gold trading accounts, then you may opt for it over physical gold. This is a better option for investing in gold in India among the others, as it has the option to redeem your units and the corresponding amount of actual gold is kept in secured vaults by the ETF providers, thus eliminating the need to physically possess or store gold by you. The returns are close to what you would get in physical gold and almost equal to that in e-Gold. Also the taxation part is better in Gold ETF as it attracts long term capital gains tax at 10% without indexation and 20% with indexation. However it has its share of disadvantages as well as you would still need to have a demat and trading account for gold ETFs, but this need not be a separate account, as your existing Demat account can suffice. Gold Mutual Funds work on similar lines as regular mutual funds and you can either buy lump sum or invest in a disciplined manner like SIP so that every month you invest a fixed amount in gold. Like ETFs even Gold Mutual Funds will attract long term capital gains tax at 10% without indexation and 20% with indexation. You don’t need any demat or trading account, nor do you need to have a locker to ensure safety of gold as they are held in dematerialized state. Gold Mutual Funds will however give less return than ETFs or E-Gold and will also have fund manager expenses for managing your mutual fund and it will eat up some part of your returns. The returns will not directly depend on the Gold prices alone but also the performance of the fund. So there you have it, if you really wish to invest in Gold, do it the right way. Opt for Gold ETF if you can manage having demat and trading account as it will give close returns to the actual Gold prices and has very low admin costs unlike Gold Mutual Funds. If you do not want to get a demat account, you can also give Gold Mutual Funds a shot. E-Gold is a relatively newer option but it has the most close returns actual gold and costs are minimal. The article on gold was v helful to me..as i always trust investing on physical gold rather than E-gold..thanks my doubts are clear now. Thanks a lot, yes physcial gold is always prefered but do consider etf as well as it has advantages over physical gold.